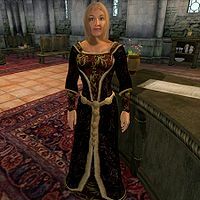 Augusta Calidia, an Imperial publican, is the proprietor of the famous and fashionable Tiber Septim Hotel in the heart of the Talos Plaza District in the Imperial City. While the hotel primarily houses and feeds upper-class citizens, Augusta unknowingly rented a room to the wealthy Atraena, and never expected her Skooma sucking husband Faelian to come along. During the Dark Brotherhood quest The Lonely Wanderer, Augusta will be more than willing to share information on Faelian’s whereabouts, to save the reputation of her establishment. Augusta Calidia sells food and beds from 6am to 2am every day, standing at her post behind the counter on the main floor of the hotel. At 2am, when all regulars are either gone or asleep, she sits down on the nearby chair and treats herself to a few excerpts from the naughty play The Lusty Argonian Maid until she returns to her duties at 6am. She never sleeps, despite the presence of a bed right behind the counter. Augusta wears upper-class attire consisting of a black and burgundy outfit and a pair of gold trimmed shoes. She protects herself with an iron mace and carries her book and a small amount of gold. When you first talk to her, and 20% of the time thereafter, she will introduce herself and welcome you to the hotel: "Welcome, friend, to the Tiber Septim Hotel. I am Augusta Calidia, your hostess." She will tell you about fun things to do when asked about the Imperial City: "Where can you find some fun? That depends of your idea of fun. You can bet, fight, or both at the Arena. There are plenty of sights to see, and plenty of places to shop, but the Watch frowns on brawling and adventuring in the city." She has four lines of near-unique (only shared by Mariana Ancharia) dialogue with regards to renting her beds. When asked initially about beds, she will say, "Why, yes. I do have a lovely room available for a mere 40 gold a night. Are you interested?" If you tell her you take it, provided you have enough gold, she will say, "Excellent. The room is on the floor upstairs, at the west [sic] end of the hall. I do hope you rest well." However, if you don't have enough money, she will say, "I'm afraid you lack the funds to rent a room. Perhaps you should consider resting somewhere else?" If you rent a bed from her and then inquire about beds again, she will tell you, "You're already staying in one room, and I don't rent multiple rooms to a single customer." During the Lonely Wanderer quest, she has another set of unique dialogue. When you ask her about Faelian, her response depends on her disposition towards you. For disposition of less than 30 she will say, "I might know him. I might not. I don't see how it's any of your business." If your disposition is 30 to 50 inclusive, she will say, "Yes, I know who Faelian is. Know quite a bit about him, actually. But... I probably shouldn't gossip. I mean, we hardly know each other..." Finally, if her disposition is above 50, she will spill the beans, saying, "Faelian? Oh, I know him all right! A waste of life, that one. He lives here you know, with his sweetheart, Atraena. What that poor girl sees in him I'll never know. Atraena pays for their room, their food, everything. She's quite wealthy, I believe. Faelian used to have money... used to be quite a gentleman, too. But that was before he took a fancy to the... you know. The skooma. Now Faelian's hardly ever here. He's off using skooma, or wandering the city looking for some, I imagine. He comes back every night to be with Atraena, but only for a few hours. I swear, that High Elf is going to wind up dead if he keeps living like this." This last set of dialogue will advance you in the Lonely Wanderer quest. Augusta was supposed to sleep in her private bed from 2am to 4am, but her reading package is at the same time and she chooses to read instead of sleep. Esta página foi modificada pela última vez à(s) 05h46min de 19 de outubro de 2015.